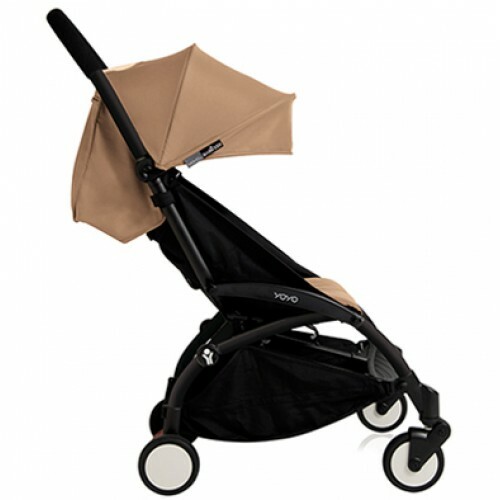 BABYZEN YOYO+ stroller can do anything, anywhere! YOYO+ folds and unfolds, is carried like a bag and is one-hand driving, fits just about anywhere, is easily stored, and can be taken as hand luggage*. Now, the all-in-one stroller for parents on the move has its very own car seat and lets big brothers and sisters have a ride sitting or standing on the brand new, super convenient YOYO+ board. From birth, baby lies parent-facing and never leaves your sight. BABYZEN YOYO+ can turn into a totally flat carrycot for infants when you use the Yoyo Newborn Colour Pack (sold seperately), a 5-point harness, a 2-position pop up canopy, a foot cover and a headrest. From 6 months and using the same frame, simply swap 0+ newborn fabrics (sold seperately) for 6+ fabrics, and sit baby up to face the road. Time for him/her to discover the world! The YOYO+ backrest can be inclined to 145° in several positions, and features comfortable padding with a 5-point harness.